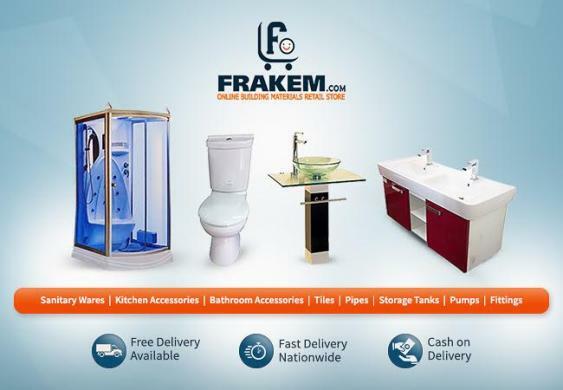 Frakem.com, the largest online building and home improvement products retail store launched its operation in Nigeria recently. This online retail store offers quality products ranging from exotic Jacuzzi, luxury sanitary wares, shower rooms of various shapes and sizes, PVC and galvanized fittings, assorted pipes, water tank and pumps. Frakem also have beautiful designs and quality tiles that give the desired finishing to your home. Buyers don’t have to waste time and search efforts any longer shopping for building and home improvement products as they can simply login into www.frakem.com and order for varieties of these products from the comfort of their homes and offices and the products are delivered to their project site or homes for free. Besides providing the convenience of shopping for home improvement products, Frakem.com also provide competitive pricing and boast itself as the cheapest site in home improvement space. Commenting on the launch of its services in Nigeria, the co-founder of Frakem.com, Festus Nwagbo said “The objective of Frakem is to simplify the shopping experience of buyers of building and home improvement products and solve the procurement problems of SME contractors and personal builders”. He went further to say, “An online retail store for building and home improvement products is the best solution for our customers as it gives them the power of choice to shop for these products directly from a reliable source without depending on middlemen. We are receiving overwhelming response in Lagos and we will soon extend our services to Abuja and Port Harcourt and we are confident of delivering best quality at the best possible time”.